According to the DomPost yesterday, there are now 105,000 jobless in New Zealand. (I wish they would use the correct terminology. There are 105,000 officially 'unemployed' but 193,000 officially 'jobless'.) 30,508 are receiving the unemployment benefit. 29 percent of the unemployed. In the US around 10 million are unemployed yet only 625,000 appear to be receiving unemployment insurance benefits. 6.2 percent. How can it be so low? Now I understand, after digging around, that each week I am e-mailed the initial unemployment insurance claims by the US Department of Labour. The department said initial claims for state unemployment insurance benefits rose 35,000 to a seasonally adjusted 626,000 in the week ended January 31, the highest since the week ending October 30, 1982. The prior week's number was revised up to 591,000 from 588,000. The number of people staying on the benefits roll after drawing an initial week of aid surged by 20,000 to a record 4.788 million in the week ended January 24, the latest week for which the data is available, from 4.768 million the previous week. I love puzzles. During the holidays I always try my hand at the Prize Cryptic in the DomPost. But I never complete one. This year I persisted in my attempts and finally, yesterday, got one out. The solution is dispatched and maybe I will win a pen. Although I have won a number of pens over the years for letters and I don't need them. Funnily, I emailed the answers in. What I do need is a new keyboard as my present one, although not very old, is missing letters from over-use. The E,R,T,O and A have almost entirely disappeared. The NZ Herald polls on What Does Waitangi Day Mean To You? I didn't even have to think about it. A day off. "It is indeed a new day for the Maori people, not because, at the level of the typical Maori family, life has got materially better, but because for the first time in a long time they feel that the colonial victors want ( and need) more from them as a people than their sullen acqiuescence at being the first hired, first fired. For that John Key will win not only their support, he'll claim their love." Key can only fudge it for so long. Property rights, constitutional issues, economic and social disparities will all have to be faced eventually. Rather than uniting Pakeha and Maori, the Treaty stands as a reminder and reinforcer of our segregated and culturally divided histories. It will not help us to move towards better understanding, more tolerance and better economic outcomes for all. It would have happened by now. The only NZ Prime Minister who was "loved" was Micky Savage. If people expect Key to follow in those footsteps then I am afraid he would have to prematurely depart this earth, or at the very least, his office. Savage died just after passing his cradle to the grave legacy. He was beatified. But in the decade that followed the people became highly dissatisfied with his predecessors over the working of social security. Maori in particular found they continued to be discriminated against, now by the newly formed social security department. Fraser and Nash were villified. They were the fall guys for Savage. And returning to the beginning of this post, if I were to ring a Maori friend and put the question to her, what does Waitangi Day mean to you, I am almost certain she would reply, time and a half. 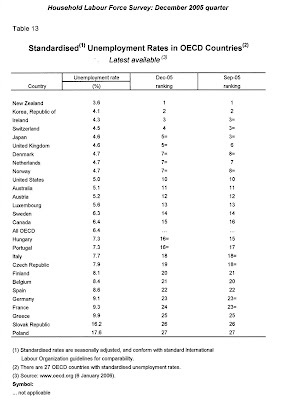 In December 2005 New Zealand had the lowest unemployment rate in the OECD. In three years it has dropped to 10th equal. Over the same period the OECD unemployment average only moved from 6.4 to 6.5 percent. Of course that small average percentage increase masks the absolute increase, given some of the really large employers (US, UK and Germany) all have significantly rising unemployment. An Australian left-wing think tank is calling for the dole to be raised to the same level of payment as Super. That is faulty thinking. Research shows the higher the level of dole, the longer people stay on it. The more comfortable it is, the more jobs they will turn down during the job search period. The numbers on the dole in Australia are already very high compared to NZ. This think tank says that as the number is forecast to go far higher - from 500,000 to 800,000 - the time is ripe to put more money into dole recipient hands. I would have said exactly the opposite. Some interesting numbers re payment rates. 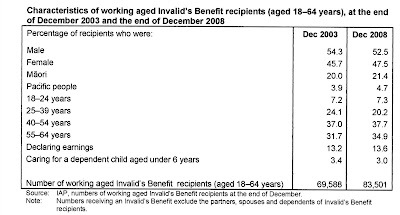 The difference between the unemployment benefit and super here is significantly higher and it has widened over the last ten years. I move in some 'circles' that people wouldn't expect. Thus I pick up interesting tidbits. A young woman was pregnant. She didn't know which of the men she had slept with was the father. But it would become clear after the birth, as the two potential fathers had different ethnicities. She told her permanentish partner, with whom she already has several other children, that the baby might not be his. This didn't seem to cause any great ructions. The baby is now a few months old and it has become evident that it does indeed belong to the permanentish partner. When I enquired if the father was pleased about this outcome I was told that he was not. Neither was the mother. "Why?" I asked. Because they would have got more child support from the other guy, was the answer. Some days I read the news and feel a wave of disbelief well up. Then it turns to real anger and frustration. Today is one of those days. Worse, I find myself wondering whether I should even comment on the source of my anger in this stifling environment of inverted values. John Lagataua is going to jail for nine months for what his counsel aptly described as exercising old fashion discipline. He is separated from his child , who loves him and misses him. One of the assault counts on which Mr Lagataua is convicted is washing his child's mouth out with soap for using bad language. Good God. I once momentarily put a bar of soap in my daughter's mouth when she came out with the F word at a very young age. I thought just the taste of it would be enough to deter her from doing it again. And it did. Am I a monster? And were our parents? Millions of kids experienced rough treatment at the hands of parents when I was growing up. Today those parents would be jailed for the same behaviour. Truly. I am bewildered, I am starting to feel 'older' because I am so out of step with modern thinking about what constitutes love and care. The worst of it is someone has decided what best methods are and we are all legally bound by their 'wisdom'. There is no freedom to say well, you do it your way and I'll do it mine. Yet children are all different. They have varying temperaments and varying responses. That is best understood by their parents. And look around you. Are children today routinely models of confident, kind and tolerant behaviour? Have we successfully dealt to youth crime, truanting, under-age drinking, suicide, self-harming, bullying? No. We have not. At the margins the extent of these problems grows. Yes, Mr Lagataua has anger problems. No wonder. He loves his kids, wants to do the best by them. No doubt, prevent them from turning into the charming young thugs he sees hanging about the streets of Timaru; kids nobody gave a damn about. But the 'experts' say his behaviour is so outrageous he must be punished with a jail term. That's twenty-first century justice for you. Working For Families has something to do with this. Total paid hours, when seasonally adjusted, decreased by 1.4 percent in the year to December 2008, according to the Quarterly Employment Survey (QES) released by Statistics New Zealand today. This is the first annual decrease in paid hours since the year to September 1999, and was mainly due to decreases in the manufacturing, construction, and wholesale trade industries. Seasonally adjusted total paid hours also decreased by 1.4 percent in the December 2008 quarter. This is very sad and I am quite gutted on behalf of those children who wanted to continue at Montessori. Our son Robert attended for three years and it presented a much needed alternative to Hutt High and other conservative private schools. Last year we became one of the families that were looking at other options only because Robert had decided it was time to move on, as had many of his other friends. But the decision he made was the result of learning to think independently, and take control. He also now has the confidence I am not at all sure he would have developed in a very large state school. The government's refusal to assist the school is also highly questionable. Before you yell, "subsidy", the state is now going to have to educate quite probably all of the ex-pupils. During Robert's time 100 pupils were off the state books. That around $8-900,000 annually. The type of child attending Montessori is not your candidate for Scots or Wellesley or Marsden. A few had special needs, were even somewhat fragile, if I can use that word. All the ex-students I know of, bar one, has gone into a state secondary school. The final 30 at closure are now going to cost the state $240,000 to $270,000 to educate instead of the $50,000 that would have seen the school survive another year. It's bloody sad and bloody stupid. Last week I blogged this letter because it impressed me. Actually the original letter says the work of the mentors is "commendable". But the work of mentors is always secondary. It is intervention when the primary source of guidance is missing. Secondary and late intervention has a significant risk of failure. The success of mentoring is variable but often quite low. That is my own experience. But that doesn't mean you abandon it as such. Similarly the rehabilitation work done with prisoners has not improved re-conviction rates enormously but that doesn't mean it should be abandoned. I will always remember Greg Newbold's response to the suggestion we should. He claims that many inmates, while they continue to offend, would be even more anti-social and disconnected and vicious without rehabilitative attempts. I think Mr Aston has misinterpreted the first writer's words. Certainly I didn't take any inference from Bruce Tichbon's words that the Big Buddy Trust was part of some conspiracy. He was merely pointing out that as a society, via social policy, we have undermined the role and purpose of natural fathers. I don't know how anyone can argue with that proposition. I think I can safely say on Bruce's behalf his 'dream', like mine, would be that every boy (and girl) had their own father in their life. Mr Aston appears to accept what has happened and to his credit wants to try and make life better for those boys his organisation can reach. That's a legitimate aim. But some of us want to undo what has happened in terms of policy. The two approaches are not necessarily incompatible. Treat the symptoms and the cause. There are at least a dozen reasons I have identified for this growth and there is a chapter dedicated to it in my (if it ever gets published) book. But the trend isn't confined to NZ and the OECD refers to the phenomenon of the "...medicalisation of labour market problems."